The Suppression of Protestant Charities in Ireland (Irish Foundling Hospitals and Charter Schools). From the Dublin University Magazine, Volume 12, Number 71, November 1838. It is a pretext put forward by the supporters of the present ministry to justify every new aggression, and palliate every fresh insult to the Protestants of Ireland, that the immense majority of the people of this country are Roman Catholics, and that this majority is continually increasing. They even affect to consider the Protestant portion of the community so very minute a portion, that till the admission lately made by the noble viceroy on his "sentimental journey" to the shores of the Atlantic, their opponents in Ireland have been usually treated as a mere cypher in their political calculations. We do not mean now to discuss the truth of these assumptions, or the legitimacy of the conclusion--that because the Protestants of Ireland are few in number, they are therefore unworthy of protection or encouragement from rulers who profess the same faith and have sworn to uphold it;--but as the doctrine is so frequently employed to excuse the policy of the Whigs towards the Protestants of Ireland, we will say a few words on one of the many means which have contributed to increase and secure this convenient Popish ascendancy. The means we allude to is the suppression of Protestant Charitable Institutions; more particularly such as had for their object the education of the children of the poor in the truths of the Protestant religion. The Popish party in Ireland, now the guide and support of her majesty's government, are fully sensible of the importance of imbueing the minds of the young with the feelings and principles which it is desired they should be attached to in after-life. They know the opinions which are earliest imbibed, are ever the most ardently clung to; and the prejudices which are first taught, are ever the most difficult to eradicate. Their serfs have reduced their knowledge to practice by providing for the poor a system of education, by which they have secured in nineteen cases out of twenty, Popish books to be read, Popish directors to control, and Popish teachers to instruct them; and by a prospective provision, in perfect keeping with their leech-like tenacity, with which they themselves cling to place, endeavouring to create an increased body of supporters in Ireland for any future ministry, who, like them, will not hesitate to purchase the continuance of their pay by sacrificing the interests of the religion they profess. Encouraging Popish instruction is, however, but one branch of the system; discouraging Protestant instruction is necessary for its completion; and while the former has been but lately put into active operation, the latter has been silently but perseveringly pursued for a much longer period; and that its success has been due almost as much to the negligence of Protestants as to the energy of their opponents, as it cannot lessen the evil of the result, is no reason that it should pass unnoticed. One of the institutions to whose suppression we allude, was the Foundling Hospital in Dublin. It is difficult to conceive a charity conducted on principles of more universal benevolence than this, from the nature of the misery it was intended to alleviate, it was necessary the assistance it afforded should be immediate and easily accessible. No complicated applications or hardly procurable certificates checked the hand of charity, till its object was beyond the power of relief. The helpless and unfortunate, to be received under its shelter, required no other recommendation than that they stood in need of its assistance. A cradle was inserted in the wall of the edifice, beside the porter's lodge. The unhappy mother had nothing to apprehend from repulse or exposure. A bell stood beside the door, which she rung, and the cradle was pushed out for the reception of the child. 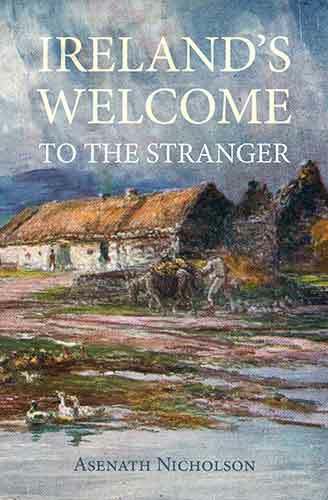 As the feelings of maternal affection in Ireland are proverbially strong, and seldom subdued, even by guilt or sorrow, few children were left without a strong feeling on the mind of reclaiming them again. A certificate, therefore, was usually pinned to the child's clothes, stating its name and age; and this, with the date, was carefully registered, so that the wretched creature, who, with a heavy heart, deposited her burden in this strange place, did it with the certainty that it would be better cared for than by herself, and could be regained when circumstances enabled her to support it. The Asylum was not confined to illegitimate children, but was open to every offspring of want or distress; and in the course of ten years, from 1801 to 1811, there were 567 of the children again claimed and restored to their parents. Many of the children were located with nurses in the country. The clergyman of each parish was requested to select the most healthy and decent women among his parishioners. He was required to certify the quantity of land, the number of cows, and the state of the cottage in which the proposed nurse resided. As all the requisites were more universally found with the Protestant peasantry, the nurses selected were of that persuasion. Besides the yearly wages for care and nutriment, a sum was annually allowed for clothing and schooling; and it was required that the child should attend the parochial school and the parish church. When he arrived at a competent age a master was carefully selected, either by the Hospital, or in the country where the child was educated. An applicant for an apprentice was required to produce a certificate, signed by the clergyman, churchwarden, and a magistrate, stating his fitness for the charge; and that he did not keep a public-house, or vend spirituous liquors; and further, that he was a Protestant. The same reason that engaged a preference for a Protestant nurse, obtained it also for a Protestant master, because they are almost invariably distinguished for decency and respectability among the peasantry. They were required to be present at divine service every Sunday; and on the expiration of the term were entitled to a gratuity, or a certificate from the clergyman, that they had properly conducted themselves. To enforce these regulations, they were not left entirely to local superintendence, but an inspector from the hospital periodically visited the counties where they were located, and personally examined the state and progress of the children. The nurses and masters became strongly attached to their adopted inmates, and were generally repaid with duty and affection. When they had served out their time they established themselves in their various callings, generally in the place where they had been brought up; intermixed with the families, and so became settled residents. It is one hundred years since this noble institution was first opened for the reception of deserted children; and at this day, in various counties of Ireland, they or their descendants form a deserving portion of the Protestant population; their origin is overlooked or forgotten, and their general good conduct places them on a level with any other class in the community. The importance of the asylum in this point of view will be appreciated by the fact, that in ten years, from 1800 to 1811, 26,085 were received under the protection of the institution; and during the same period 1599 were apprenticed, and became in this way useful and respectable members of society. Human prudence could hardly devise a more effectual means of remedying the evil of their birth, than converting it into a national benefit. From the year 1796 to 1826 there were in all 52,150 received into the institution--in 1812 alone there were 2670! and there were generally about 7000 under its protection. In the report of the Board of Education in 1810, we find the Commissioners were struck with the order and regularity, as well as the neatness and healthy appearance of the children; the whole economy of the hospital appeared to them truly admirable. Of the gentleman who conducts it, they say, "we feel ourselves bound to say that his plan of instruction, and the success that has attended it, gave him the strongest claims to public notice. We had an opportunity of witnessing the progress of the children under his care, and found it fully answerable to the high character we had heard of it." The institution was reduced in 1821. The report of the Commissioners of Inquiry in 1826 is far less favourable. They, however, in the highest terms commend the conduct of the directors. They object to large boarding-schools in principle, and, therefore, recommend some alterations in the system of education pursued here, which were afterwards partially adopted with success. "A farmer was planting potatoes, and his labourers went to dinner, leaving a sack half full of cut potatoes on a car. When they returned they shook out the potatoes for planting, when an infant fell out among them. The ground was soft and it was not injured. The mother was never discovered, and it now remains with a poor labourer's wife who has several children of her own. Another instance occurred a short time after. A cotter's wife went to a neighbouring mill for meal, leaving only a child behind to mind the house. On her return she found a large wisp of dry ferns lying on the floor, which she took up to place as fuel under a pot of potatoes. When in the act of doing so, she was shocked at hearing a child cry, and then found that it was rolled up in the bundle of ferns. She learned on inquiry, that during her absence a woman had come into the house with something wrapped up in a shawl, and requested the child to get her a drink of water, and while she was bringing it to her, the infant was transferred to the bundle of ferns. A female had been observed watching the return of the woman from behind a hedge, but she disappeared the moment she came. The poor woman had seven children of her own, and could find no trace of the person who had left this eighth to her care. She had no alternative but either again to expose it, or endeavour to rear it with her own. She preferred the latter--the very helplessness of the infant attached her to it, and she took great care of it; but it caught some disease, for which the wet potatoes and water which she gave her own children were not fit food, and the child died. As the ecclesiastical commissioners were supposed to have taken upon them every thing which a vestry formerly provided, they were applied to for a coffin, but this was refused, and the putrid body of the foundling actually lay for some time among her own children, tainting the air of the cabin, before she could get the means of burying it." There are, we know, some who, on principle, object to foundling hospitals, as an encouragement to vice. It would be out of place here to discuss the question, though it is evident such objections apply with equal force to lying-in hospitals, or, indeed, any asylum for the destitute. However, such reasons had little weight in causing its suppression, for a provision was afterwards made for deserted children by application to the grand jury, but beset with so many difficulties and delays, as to be seldom available; and even when resorted to, the sole dependence of the infant is the good-will and honesty of its casual protector, over whom no further control is exercised, so that the little helpless being is exposed to all the extremities of want, sickness, poverty, without education, religious principle, or moral restraint--the very scorn and outcast of society. The noble institution where all these evils were carefully counteracted, is now closed up--its courts grass-grown--its roof falling in--its windows broken--exhibiting, with the young population that once filled it, a melancholy picture of moral as well as physical ruin. At the same time when the suppression of this institution was begun, an attack was commenced on another class of charities, whose object was the education of the poor in the Protestant faith--the Charter Schools of Ireland. The commissioners who recommend the abolition of the former, express their high approval also of this sacrifice. The appropriation of the estates of the Protestant Charter Schools was the first step taken towards the more extensive confiscation of the Protestant property in Ireland, and the prelude to the aggressions on the church. The objections to the Charter Schools and the Foundling Hospital were much of the same character. It is needless to detail them; whatever may have been their faults, it is evident they were capable of being remedied, without perverting the original object of their endowment--the encouragement of Protestantism. When a fund has been devoted to a certain purpose, it does not in the least justify its suppression or application to other purposes, to say that it has not been employed in the most efficient manner conceivable, or been productive of all the good imaginable, while the errors in its management may be corrected. We should be glad to see the doctrine applied generally to the Whigs --that because some of the innumerable sub-commissioners, whom their place-providing ingenuity has fitted with an office, had misconducted himself, his office should be abolished, and the hopes of the reversion of his place and pension snatched from among their expectant dependents. As to the supposed abuses, however, in the conduct of the Foundling Hospital and Charter Schools, it does not appear that any suggestion for their improvement was ever neglected, but, on the contrary, eagerly adopted by their directors. In one particular, at least, the former institution would be worthy of imitation. From the report of the commission, in 1829, it appears that the total amount of the retired pensions paid by this immensely extensive institution--the influence of which spread to the remotest parts of Ireland, and which had then under its protection nearly 7,000 human beings--was not, in all, £350 a year! There can now be but little doubt of the real motive of the outcry raised against these institutions. However specious the arguments employed against them--though they may have occasionally satisfied the indolent or blinded the well-meaning--if traced to the source that suggested them, they would be found to have originated in an undying and uncompromising hostility to every thing exclusively Protestant, The first reflection was, better far the innocent victim of its parent's guilt should perish by its mother's hand than be reared a heretic--better far to be brought up in a life of drunkenness, idleness, and profligacy, to earn their bread by prostitution or by theft, and end their days in a gaol or an hospital, than be led in the path of industry and virtue, if the blessing is to be conferred by a society of heretics--better a temptation to murder should be offered to the old, and a means of escaping the contact of vice and misery snatched from the young, provided the means that tend to lessen the one or increase the other, can be devoted to purposes more congenial to the spirit and less hostile to the progress of the Popish religion. That other plausible arguments were discovered against these institutions is no proof that the real objection was not as we have stated. Such reflections are not more consistent with the intolerant and persecuting-spirit of their religion than the concealment of them is with the usual indirect and Jesuitical course of their policy. The recent concession of the revenues of the church was made in the hope of securing peace and reconciliation; and such hopes were warranted by their professions, but the moment their point is gained and deceit is no longer useful--the moment the victim is secured, and the sacrifice is certain, the mask is cast aside, and we are told of their "conviction that the bill of last session, instead of being an additional security to the parsons, would increase the resistance to the payment of tithe--that it will bring into the field a new class of White-boys--that is, of tithe resisters." "I have reason to believe, as I sincerely hope" continues their leader, "that resistance to the payment will be augmented and not diminished by the late act of parliament."--Mr. O'Connell's letter, Oct. 3rd. Such is their policy now--such it was previous to the passing of the emancipation act--such in a thousand other instances; and surely we are warranted in concluding that the suppression of these schools is not an exception. It is, of course, not to be expected that any of these charities will ever be revived. No--institutions that subtracted thousands from the growing mass of discontented vice and reckless degradation, to mix with the peaceful, industrious, and enlightened--such as the Protestant portion of the population of Ireland universally are--present too formidable an obstacle to the now dominant party. But their extinction may teach the Protestants of Ireland a useful lesson. The means which held out an inducement to the children of Protestants to continue in the faith of their fathers, and instructed the unfortunate and the destitute in the truths of the same pure religion--which added annually to the Protestant population of the country multitudes rescued from death or infamy--have been destroyed; while the convulsed and agitated state of the country is now, each year, draining it of its Protestant inhabitants, who are driven, by the hopelessness of expecting better times, to seek refuge in emigration. Schools where the Bible was read--where the pure doctrines of the reformed religion were taught, and whence the mummeries of superstition were excluded--have been suppressed, and the funds that supported applied to other and far different purposes; while schools have been established in every corner of the kingdom where the word of God is not read, where the doctrines of Protestantism are not taught, and where the popish religion is disseminated with all the success that the untiring zeal of the teachers, and ardent encouragement of the patrons, can secure; and all this has been done under the pretence of impartiality, by one class of advocates, and a disgusting affectation of good will to the cause of the reformed religion, by another. The Protestants of Ireland have calmly suffered their Church to be plundered of one-fourth of all her revenues. The leader of their enemies declares that the assault is but commenced, and that what they have lost is but an instalment of what they are to lose. While the means of support is thus taken from the ministers of the Protestant religion, applications are eagerly pressed and graciously listened to for increasing the wealth and importance of institutions for the education and maintenance of the Romish clergy;  and their less cautious friends plainly avow their hopes, that all the ecclesiastical revenues of Ireland are soon to be devoted to the same cause. It is unnecessary to draw the moral of such a parallel. Vide the address of the deputation of Romish Bishops who waited on Lord Normanby last month.